Everybody has some sort of food that they like to cook when every other idea fails or during weekend when they rather spend less time in the kitchen and more on the patio. For me it’s pizza, as you have already guessed, more precisely the simple mushroom and chicken kind. This is an easy lunch and also pretty light too, I only used crimini and shiitake mushrooms and some leftover barbecued chicken and that was it. The best part about it, you can even store the leftovers in the fridge and enjoy them the next day but probably most of you already do that anyway (wife loves cold pizza). Personally, I hate day old pizza, especially cold, but this one really worked and one day later, the taste and texture was pretty much the same like the day I baked it. Enjoy! Preheat oven to 500° F / 260° C.
Chop the mushrooms in small pieces and sautee them in a tablespoon of olive oil until all the water goes out from them, usually 10-15 minutes on medium. Roll out the dough and place it on a pizza tray. 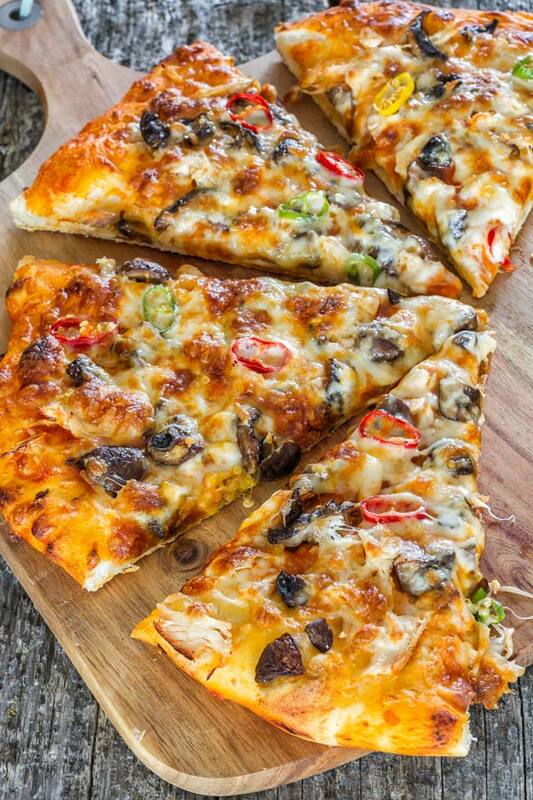 Spread pizza sauce evenly over the surface of the pizza; add chicken and mushrooms. Top evenly with mozzarella cheese and slices of hot peppers. Hey, This recipe looks super-“buona”! Thank you! I’m doing a pizza party and this is now on the menu!!! Thanks for a great idea.